I don’t know about you, but I don’t have a ton of time on my hands for craft projects. I wish I did. Even more so, I wish I could get paid to browse JoAnns and Michaels because I could spend hours walking their aisles for supplies for all of the crafty projects I will probably never complete. (Thanks, Pinterest!) But I’m telling you right now – don’t just pin this project to make later only to forget it even existed. Make it. Still pin it (just because I’d really appreciate it), but make it. It only took me ten minutes and probably took longer getting the supplies together and taking the pictures than actually working on the project. Step 1. 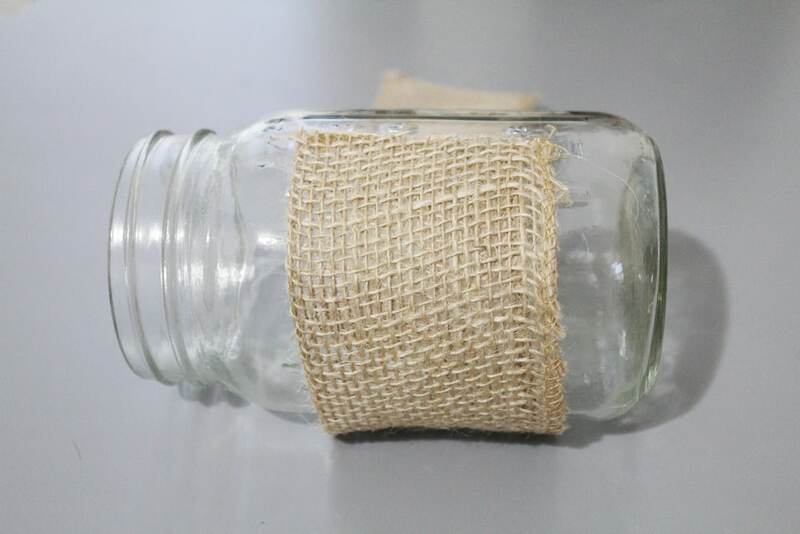 Cut the lace and the burlap to be about the size of the jar. I cut mine a little longer and overlapped them when I glued it down, but you can cut it to be exact if you’d prefer not to overlap them. Step 2. 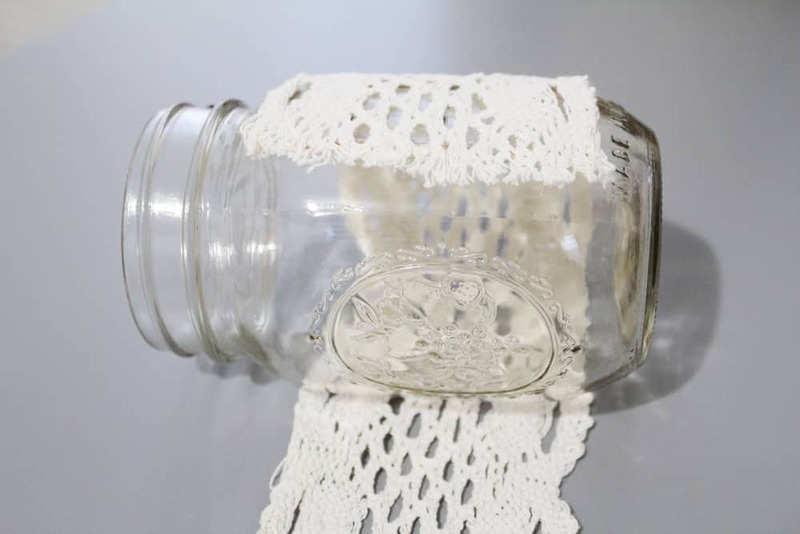 After the glue gun has warmed up, draw a thin line of glue along the edge of the lace and press down on the glued area against the jar as straight as you can. Step 3. Repeat step 2 for the other end and wrap the unattached end around the jar. Pull tight and press down where the glue is to attach. Step 4. (Optional) Depending on the height of your burlap, you may want to cut or fold it over. I chose to fold it over for a darker look from the candle, but either way will work. If you do fold it over, make sure the fold makes one side a little longer to be the outside piece so it looks a bit more polished. Step 5. Repeat steps 2 and 3. Do the same thing you did with the lace for the burlap. Step 6. Set the tea lights in the jar (I used battery operated, but regular ones will work fine) and set up to display on your table! Pretty and easy, I like! So easy and these would look great out all year long! love versatility! 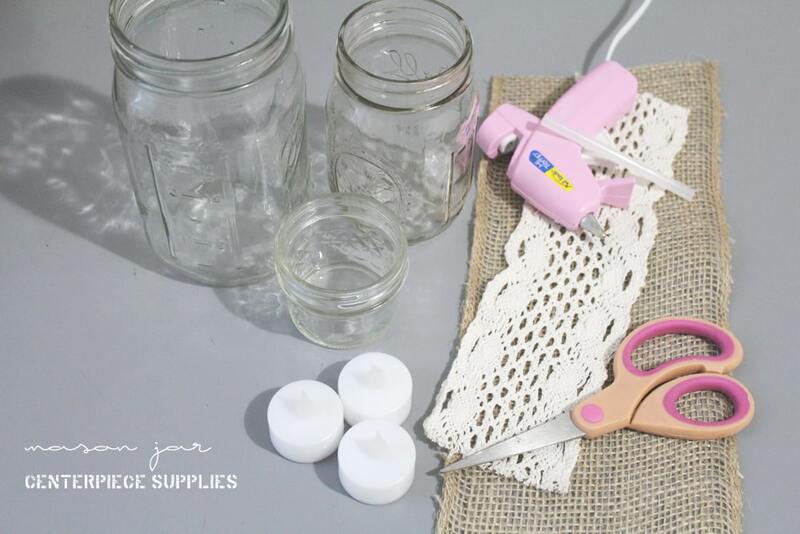 This mason jar centrepiece is so simple yet beautiful! I love the little jelly jar too, I need to keep an eye out for one of them! Thanks, Amanda! Love the jelly jars – so useful! I have some of these in my home too. I LOVE them. So classy and so easy. I always look for easy DIY projects, and this one is lovely!! Adding it to me to-do list! Thanks for sharing! I love this! Thanks so much for sharing. 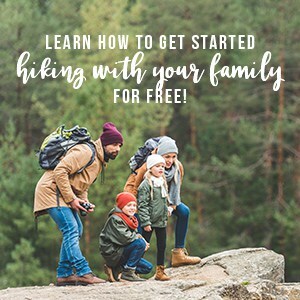 It’s so simple and easy and looks gorgeous! Super cute… Love how simple and gorgeous it is. 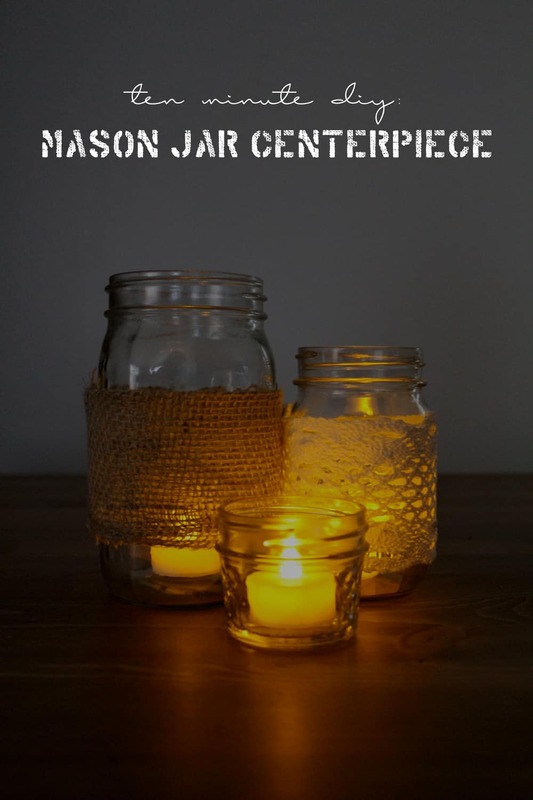 I’m featuring your mason jars in my Friday Features tomorrow… thanks for linking up to Inspire Me Monday. Oh, loving these! If I was getting married these would look gorgeous with fresh flowers. I can definitely see these as an awesome table piece for summer BBQs! The mason jar is really useful, I love how creative you are, to make it as a table centerpiece. Thank you for this beautiful project.